Please join us as we celebrate Shambhala Day and begin the Year of the Earth Pig! All are warmly welcome. 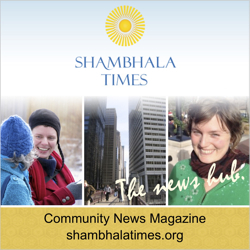 Shambhala Day marks the beginning of the New Year and represents one of the most important cultural traditions in Shambhala. The day is calculated astrologically according to the Tibetan lunar calendar and changes every year to coincide with the annual lunar cycle. Shambhala Day is a time for us to express the wealth and richness of our spiritual and cultural heritage through feasting, conviviality, elegance and pomp. We will begin gathering and socializing with coffee and tea at 9:30am. Acharya Judith Simmer-Brown will lead us locally, including guiding us in White Tara practice. The international broadcast will begin at 11am. At this poignant and tender time in our community, we invite everyone to self-organize and have brunches in small or larger groups. We also welcome all to a soup-and-salad potluck in the Community Room immediately after we conclude in the Main Shrine Room. If you would like to bring a pot of soup, a salad, a loaf of bread or anything else to make a warm, lovely community meal, please bring items and drop them off in the Community Room. Please help us plan for the right number of people by registering here. Help us prepare for Shambhala Week festivities! Please sign up to volunteer here.